I’ve written before in previous posts about my early exposure to Cajun food. Our family made yearly summer treks to south Louisiana to visit my Aunt Sarah and her family and it was there that I was exposed to a variety of Creole and Cajun cuisine. I developed an early appreciation for gumbo, jambalaya, étouffée, red beans, and andouille sausage. My college years were spent in south Mississippi where crawfish were plentiful during the spring. As I write this post, memories of sunny afternoons during those years with a few beers and pounds of boiled crawfish flood my mind. For those of you who don’t know, crawfish, also referred to as crayfish, crawdads, freshwater lobsters, or mudbugs resemble small lobsters to which they are related. These freshwater creatures are abundant in south Louisiana and the tails, which some compare to shrimp, can be fried, boiled, or used in various other forms, such as étouffée. Many people speak of sucking the heads of boiled crawfish, but frankly I’ve tried and I’ve only found that they yield some of the boiling liquid. Étouffée, pronounced ay-TOO-fay, literally translates to “smothered”. This stew starts with a roux, or browned flour in some form of fat. The “holy trinity” of Cajun cooking, consisting of onion, celery, and bell pepper, sautes in the roux to form the base of the stew. I’ve been making étouffée for years and for this post I reviewed several different versions to see if there were any tweaks I could make to my recipe. I tried a couple of different things in this version. I usually make roux with some form of vegetable oil and flour. For this recipe, I made the roux with part butter and part oil. Additionally, I found a recipe that added some heavy cream just prior to serving. I’ve never used cream in étouffée before and I loved it. The cream most certainly makes the dish a bit richer, so if you prefer a lighter version you can skip the cream. 1. Melt butter in a large Dutch oven over medium heat. Add canola oil and 3/4 cup flour. Whisk until well blended and smooth. Continue whisking for the next 15 to 20 minutes or until the roux is about the color of a brown paper bag. If you prefer a more intense flavor, continue cooking until it reaches the desired color. 2. Add celery, onion, pepper, and garlic. Stir until combined and cook for three to four minutes until vegetables are softening. Add three tablespoons of flour, mix well, and continue cooking for an additional 3 to 4 minutes. Add chicken stock, tomatoes, Worcestershire sauce, thyme, salt, pepper, and Tabasco sauce. Bring to a boil, reduce heat, and simmer for 30 to 40 minutes or until vegetables are tender. 3. Add crawfish tails and cream if desired. Stir to combine and heat through. Adjust with salt, pepper, and Tabasco if needed. Serve immediately with rice. Garnish with sliced scallions. I’m from South Louisiana and I always add cream cheese to my etouffe. It is phenomenal. Just a cup or so. I made my first crawfish etouffee with heavy cream on a whim about 4 years ago (as I add heavy cream to just about any/all of my sauce based dishes) it always makes the flavor deeper and more rich. You cannot go wrong. I am in for a Louisinia food anytime. This dish looks super colorful and yummy looking. I love the cream in it. I haven’t made in a while, craving it now. One of my fondest college memories (those I can remember anyway :)) is going out to the ditches around Natchitoches and scooping up crawfish, coming back to the house and cooking them up. They are SO good and etouffee is one of my favorite dishes! 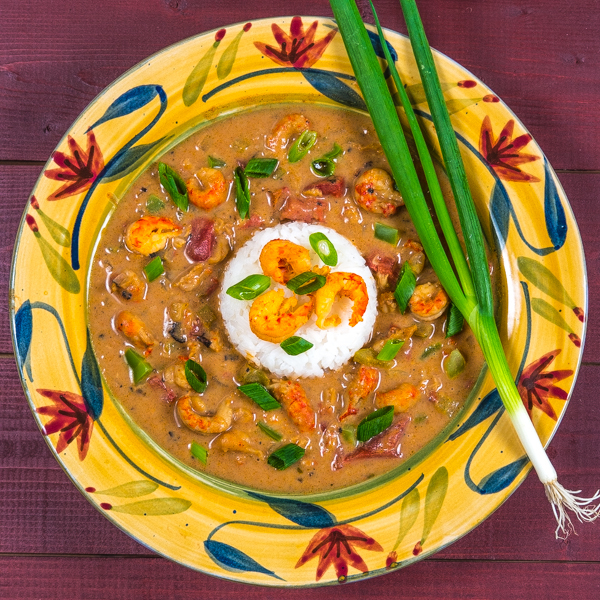 What a great etouffee recipe! I’ve never used cream either, but it certainly looks like it makes a rich and tasty bowl of goodness. I love this dish! And for some obscure reason, I’ve never made it – don’t ask me why not, because it’s not hard. Just haven’t done it. And I’m glad you’ve reminded me that I need to. Your version looks wonderful! I, too, have tried the crawfish head sucking experience and found all the hoopla about it puzzling. Too much work for zero payoff. Anyway, good post – thanks. Your recipe makes a lot of roux. My recipe I use 1/2 cup flour and 1/2 cup butter. I thought I made a lot of roux, because I’ve read other recipes and they use even less than me. But the roux is the most important step as far as I’m concerned and the key flavoring. I will have to try your recipe. Thanks for posting. This is Louisiana comfort food at its finest. This looks really good. This looks so amazing! I seriously could eat two bowls of this!